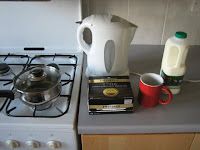 B3ta recently asked whether it was cheaper to make a cup of tea using an electric kettle or a gas one. My gut feeling on this was that gas was cheaper, because gas is a lot cheaper than electricity per unit energy. I've done an experiment to see which is actually better. Starting with gas, I put a mugful of water in a steel saucepan and heated it over a low flame. 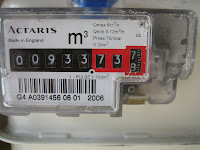 I can measure the amount of gas used using my gas meter. I've completely shut off my central heating boiler, including the pilot light, so no other gas is used during the experiment. This took 0.0092 cubic metres of gas to bring it to the boil. I'm calculating the energy and cost based on my last gas bill, which explains how to convert from cubic metres to kWh - ultimately by multiplying by 11.0786. 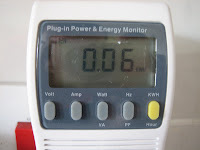 So I've used 0.102 kWh. I pay 2.88p per kWh for gas. USwitch.com reckons I could get gas for 2.86p from another supplier, so I'll use that. That makes a total of 0.29p. Next I set up an electric kettle with a plug-in power meter. I've got to use half a litre of water to cover the element and make up the 'minimum' mark on the kettle, which is slightly more than the mugful I boiled in the saucepan. To boil this took 0.06kWh. The cheapest electricity I could find on USwitch was 11.21p/kWh, so this cost me 0.67p. Even given the inaccurate measurements in this experiment, gas is the clear winner. But what if I've got friends round? I did a test with a large teapot full of water as well. This time, the saucepan took .281kWh for 0.82p, and the kettle took .140kwH for 1.57p. Still nearly double the price of the gas option. Boiling speed is another factor - the gas saucepan takes a lot longer to boil than the electric kettle. I did some more experiments, using the gas turned up higher than I normally would. I expected this would waste gas, because a lot of heat escape round the side of the saucepan. However, it was barely any extra. There's probably a 'sweet spot' for the gas flow - too high would waste gas, and too low would take so long to boil that heat gets a chance to escape from the saucepan. Still, I couldn't get it as quick as the kettle. The kettle isn't a fast boil one - it's about 2.2kW. 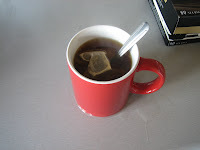 Even so, in all the experiments I measured time for, the kettle is twice as quick. So for the extra third of a penny it costs to boil the electric kettle, and the convenience of having an automatic off switch, I may well stick with that for the time being. You'll notice that the kettle uses less energy despite costing more. Does this mean the kettle is more efficient? Not necessarily. The kettle is more efficient in itself than the stove and saucepan, but a lot of the electricity comes from gas in the first place. About 36% of our electricity comes from gas-fired power stations, and the best stations are about 58% efficient. Another 37% comes from coal, but I haven't found efficiency figures for those yet. If our electricity came entirely from gas, the kettle would use about the same amount of energy as the stove. To do a fair comparison you would also need to know how efficient the national electricity grid is, and how much energy is used in pumping gas around the country.